Yesterday the Union Pacific 844 steam engine chugged it's way into our little town on it's tour through the southwestern United States. We were very lucky to have it stopped for an hour and a half for scheduled maintenance, water, and oil so close to home. The crowd that gathered was mixed in ages but it looked like mostly seniors and school children. 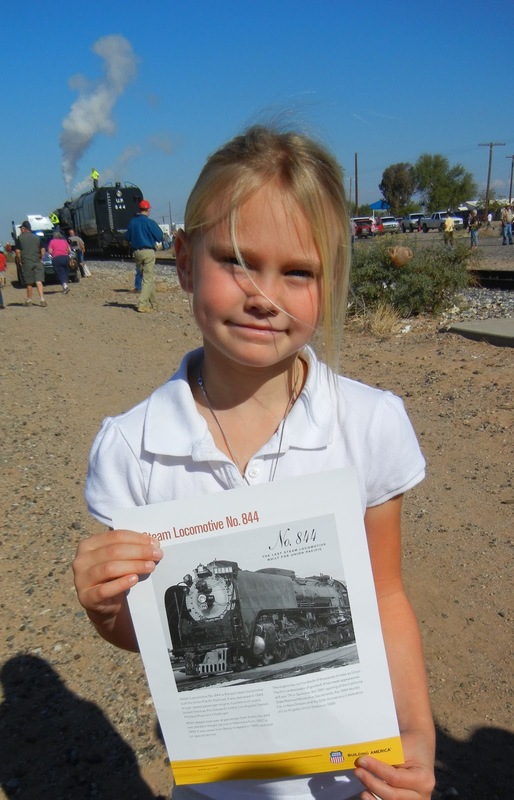 One of the local schools sponsored a field trip for all of their third grade classes to witness the historic trains arrival. Two of my grandchildren were among the school field trip groups, two other grandsons were pulled from school by their mother to be there, and two more grandsons were there with their daddy. the kids all squealed in delight! The workers from the train handed out souvenir fliers with photos of the 844 and some fun facts. path for the oil tanker to pull up to the train. A great big hose was filling it with water on the other side. The workers got right to work on the scheduled maintenance. Papa pointed out to the kids to notice how big the wheels were. to witness what might be a once in a lifetime experience. into the sky. It was very cool! Papa also answered any questions that he could. The boy's daddy really wanted to be there with them but his school and work schedule made it impossible. I was very happy to hear that as their daddy was leaving his class for the day that he had to stop at the train crossing for a oncoming train. Can you believe his luck? The historic 844 steam engine and he crossed paths right there! It was a wonderful outing for Papa and I to share with our grandchildren. You can check out the Union Pacific 844 tour schedule here to see if it will be heading to your area. If so, load up the kids and go see this steaming masterpiece of americana!